Ancient civilizations developed building techniques that allowed for the creative use of stone and other materials in fashioning impressive entrances to temples and other important structures. Egyptian sites such as the temple of Karnak in ancient Thebes (today’s Luxor) illustrate the importance architects and builders of that time placed on the location and design of portals. The ancient cultures that thrived in the area of present day Pakistan and India continued developing these techniques which were further refined and took form in the beautiful symmetry of Greek and Roman arches. Unfortunately, current architectural fads don’t always take doorways seriously which seems to lessen the effects of passing through, except for the inevitable revolving door conundrum. While I’m someone who clearly lives in the present, my love of history and art also feeds my interest in architecture. During the years I lived in the Middle East–when the entirety of the ancient world seemed to be readily accessible–my favorite destinations were those steeped in history. I would search the UNESCO website for a likely candidate for my next adventure, all the while keeping an eye on my travel budget and time restraints due to work. During those years, one of my favorite destinations was the island nation of Malta, situated in the Mediterranean Sea only 90 miles south of Sicily. This group of rocks rising out of the sea has been witness to human exploits since long before the Greek writer, Homer, sent Ulysses off on his Odyssey. Every street in the capital, Valletta, exposes layers of history that tell stories of conquest and defeat as a variety of cultures inhabited the islands over many millennia. From the heavy stone portals of the islands’ early Neolithic peoples through to the Baroque influences begun in the late 16th century, this tiny country offers a fascinating mix of architectural and cultural history. The ancient stones and beautiful archways have intriguing stories to tell if a traveler takes the time to listen. It’s only a matter of passing through with a mind that’s open to new adventures. So be aware of the magic that may lie just on the other side of the many portals we pass through on a daily basis. Thank you for those kind words Rebecca! My family is from nearby Sicily, so this great post has special meaning for me. Thanks! Glad to hear you enjoyed Robert. Believe it or not, I still haven’t made it to Sicily, but it’s at the top of my list when I return to Europe! Love the photos of Malta. What a new perspective – for me, anyway – of portals or doorways! I will be more “aware of the magic that may lie just on the other side of the many portals we pass through on a daily basis.” Thinking about it, we do enter a different world whenever we cross the threshold of a friend’s house or a place of business. I think there can be a burst of freedom felt after walking through a doorway. Imagine the relief we feel upon leaving the dentist office, a hospital etc. I think I still harbor that feeling of freedom that I knew lay just on the other side of the door to the house where I grew up as a child. Crossing that threshold and leaving parental discipline behind was a real high as a child. Thanks for your comments! OOH- ENJOYED THESE PICS AND THOUGHTS – AND HOW TRUE – PORTALS – JUST BEYOND THE NEXT DOOR – OR ENTRANCE OR STAIRWAY, ETC. ADVENTURE AWAITS . AND ON THE ROAD – JUST AROUND THE NEXT CURVE OR OVER A BRIDGE OR UP A MOUNTAIN. LIFE CAN BE FULL OF ADVENTURES – EVEN AT HOME OR IN TRAVEL !!!!!!!!!! Great photo Jim! I spent some time in Peru last year. 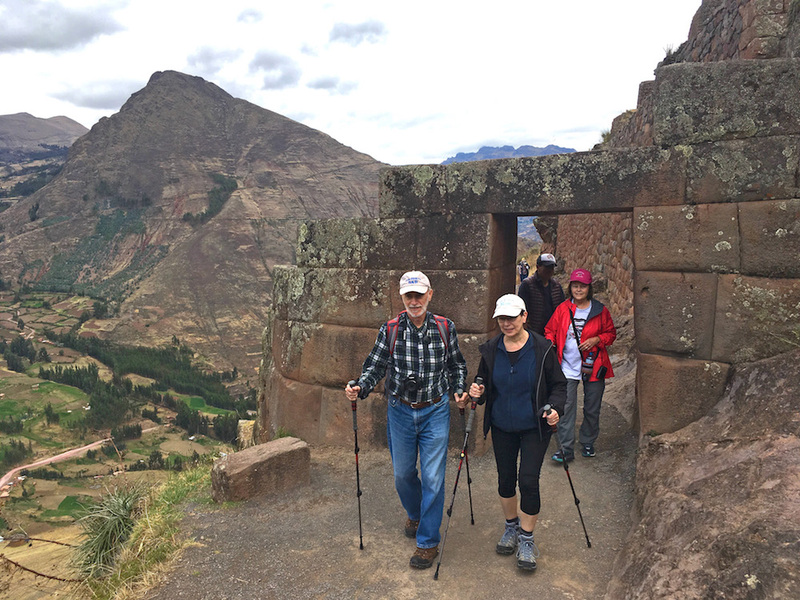 The Incas certainly were master stone-workers and built beautiful doorways. Thank you Besides Machu Picchu, we visited several other sites. All of them featured beautiful stone work. Plus, prior to the Inca, other cultures left wonderful remains. As always, a very interesting and informative article. The portal to torture is more than disconcerting, as people are still tortured today. It seems we have come nowhere as a whole, even though parts of society have succeeded through a portal of “civilization”. True, the term ‘civilization’ no longer applies, if it ever did. I try to maintain hope that more people are becoming aware and learning from history. Thanks for sharing your thoughts! Thank you for your relevant articles. Wonderful meditation on our human fascination with doors and portals as metaphor. History, adventure, personal inquiry. You brought it all together in Malta. Actually, Malta’s history brought it all together. Thanks for reading! Delightful post, Henry. I have a fascination with doors — love those Instagram accounts of doors from around the world, and have in mind an art project where I fill a gallery with doors I’ve painted and people can walk through them, etc. At the end of last year I got a door from the Habitat for Humanity thrift store and turned it into an abstract geometric painting for a local coffee shop. All because of a fascination with doors that your post helps to illuminate! Thanks! Thanks Kevin. Doors (and doorways) are fascinating. All the best with your art project! Those worked stones… Wow!!!! Amazing. I agree Judy. I have a real affinity for stone. Thanks for stopping by! Yes. I do, also. I have some in my yard that you would love.